The successor to the Trekz Titanium bone-conduction headset has slimmed down considerably. 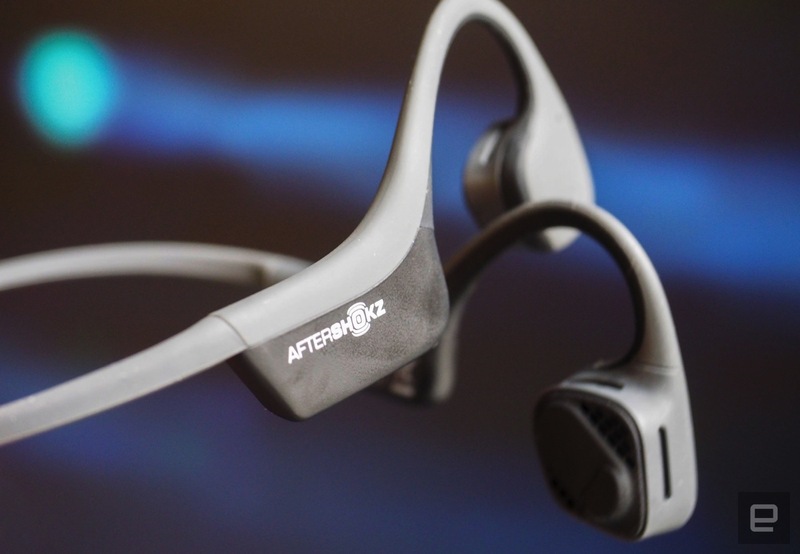 When Aftershokz released its Trekz Titanium bone-conduction headphones, there was a marked change from the Bluez 2 line before it. The design shifted from a stiff plastic headband to a ruggedly flexible and sportier design. Today at IFA in Berlin, the company is launching the next step in the series called Trekz Air with a retail price of $150 and pre-orders beginning September 1st (in the US). The overall style and concept remain the same, except for the 17-percent lighter weight and visibly slimmer silhouette. I've been using the Titanium model on my bike rides for the past year and have enjoyed the more casual fit, but this new model that I tested for two days really raises the bar in terms of comfort. It's worth noting, though, that in a side-by-side comparison, I found this slimmer package may have lost a tiny bit of oomph in terms audio output -- but that slight tradeoff might be worth it. Overall, aside from the exterior design of the Air, the specs remain nearly unchanged from the Titanium model. The frequency response of 20Hz ~ 20KHz and play/talk time of six hours are the same, but the new model does have Bluetooth 4.2 on board and the wireless range seems better than the 33-foot rating, at least in line-of-sight tests. Standby time, which has always been great, is doubled from 10 to 20 days, at least on the spec sheet, since I haven't had time to let them sit nearly that long. There's a built-in microphone so you can also use these to take calls, and the button on the left earpiece lets you control audio playback and accept or drop calls as needed. Additionally, the headset is IP55 water resistant, so you don't have to worry about those rivulets of workout sweat hassling your gear. The biggest benefit from bone-conduction headphones is situational awareness and safety, whether for cycling, running, hiking or walking around town. (They're also pretty handy for mobile turn-by-turn directions if you don't want to distract other people in the car while you're driving.) Your ears always remain open to the sounds around you while music is sent directly to your inner ear through the cheek bones. That's not to say that if you crank up the volume some sounds won't be drowned out, but we can't always have everything, now can we? Now, volume-wise, I've always found the Trekz to be more than adequate on the occasions I use them, knowing that bars, subway commutes and other noisy venues don't play well with this type of headphone. 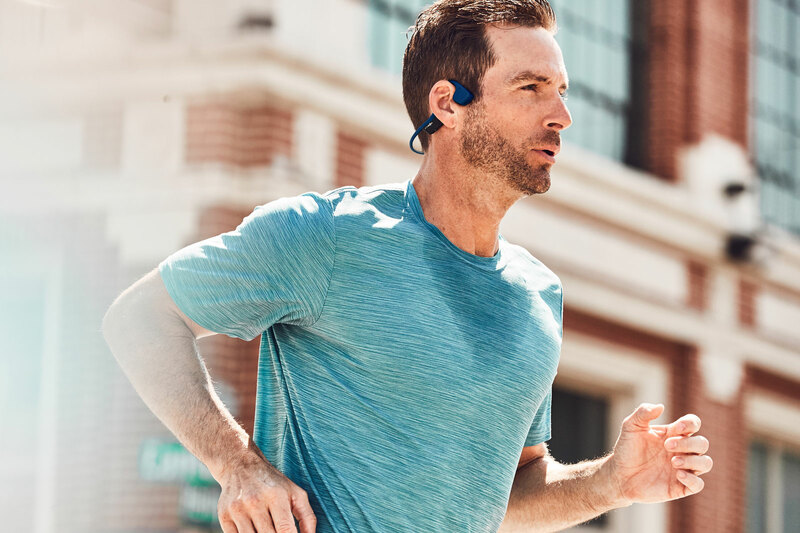 There is a distinct difference in sound when using bone conduction as opposed to earbuds or ear-covering models, but as I mentioned, you can't have everything and once you get used to them and the benefits they offer, it's easy to become a convert. When I first tried the Trekz Air, for my bike commute, I was amazed at the new lightness in fit, with the design tailored more toward your ear and lightening the rear portion of the headband so it doesn't need to droop down, making the Air designation well-earned. Also, shirt collars and low hoods no longer nudged the headphones' position, which would happen sometimes with the lower-slung Titanium model. The audio quality was still great and all of the controls remained in familiar places. After comparing the new Trekz Air side-by-side to see if the company's software tweaks improved the bass quality of the audio as stated, it's hard to tell, at least from a frequency standpoint. The Air seemed to have a more slightly crisper sound over the Titanium model, but the latter appeared to have more volume and tactile vibration. The bottom line is that if you like the bone-conduction concept, either of these versions rank tops out of the models I've tried. 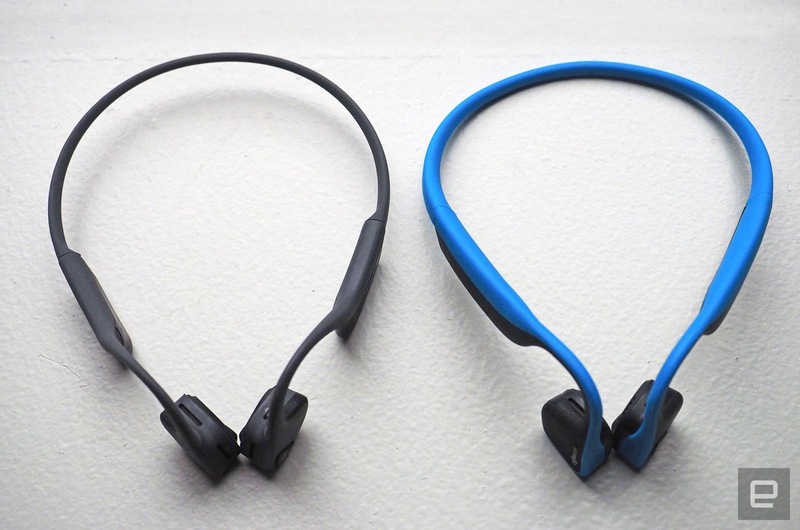 If you desire an ultra-lightweight headset, the Trekz Air is a great option. If you want to make sure you get the loudest possible headset, the Titanium should still be a consideration, although you'll only notice a slight difference if you test both. After the brief day or two of testing, I'm still up in the air as to which is the overall winner for sound quality, but the feel of the Trekz Air model definitely sways me. As long as you're not fighting your surroundings for volume, you'd rarely notice a difference anyway. Pre-orders for the Trekz Air (slate gray only) start September 1st in the US, priced at $149.95. Those in the UK and Europe will have to wait a bit, but the prices will be £149.95 (UK) and €169.95 respectively.